It doesn't matter if you're slashing or stabbing, Shadowblade was designed to get the job done. Designed as a multi-functional, easily concealable, the oak leaf dagger was a favorite of woodsmen, rogues, assassins and insane circus clowns everywhere. The flared blade had a number of uses. 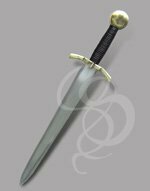 First and foremost, the flare gave more surface area to the blade, making for deadly slashes (think of how a scimitar works and you're on the right track). And when it came to stabbing, there were few daggers capable of causing as grievous wounds as the oak leaf. The narrow tip would puncture armor and cartilage and the wider foible would rip the wound open wider. As its name implies, Shadowblade was designed for easy concealment as well. 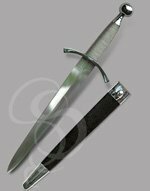 The flat, rectangular grip, the compact leather sheath and the overall slim profile of the dagger would have allowed outlaws and assassins to strap the dagger to a leg or back, underneath their clothing. 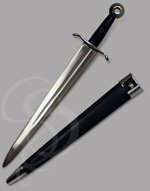 Shadowblade is forged from Strongblade's standard high-carbon steel, which means that it will hold an edge well if you should wish to sharpen it (if you're an insane circus clown, please do not sharpen this dagger). A single fuller runs along the center of the blade giving the dagger more strength. 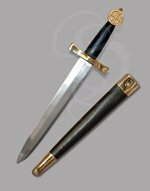 The grip on this dagger is made from a rectangular piece of wood, slim in profile for easy concealment. The wood has deep ridges along its length for a very secure no-slip grip. This wood is wrapped in rugged double-stitched black leather for comfort. 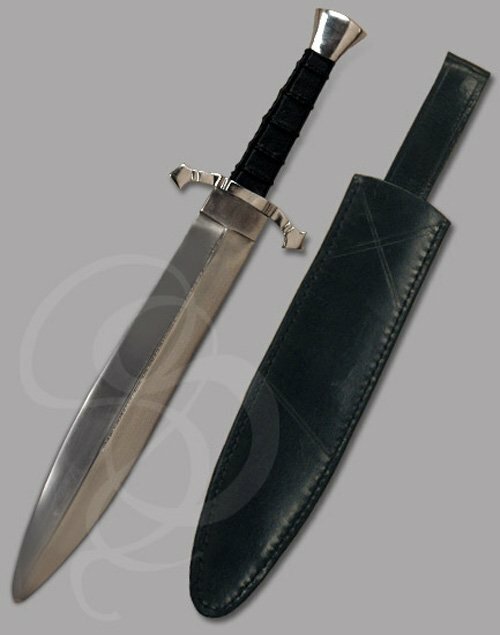 So, whether you're looking for a dark piece of history to display in your collection, or wearing it around town as part of your rogue/ranger costume, the Shadowblade will certainly draw attention (even if it's original purpose was the opposite). I like a knife like this. It's as good as a club even if you can't use the blade. A versitle weapon.